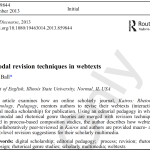 This article picks up, literally, where another one leaves off: “Assessing Scholarly Multimedia: A Rhetorical Genre-Studies Approach” in Technical Communication Quarterly (Ball, 2012). In that article, I describe how I have brought my editorial-mentoring work with Kairos: A Journal of Rhetoric, Technology, and Pedagogy, which exclusively publishes “born digital” media-rich scholarship, into undergraduate and graduate writing classes. This article describes how the process of editorial peer-review translates into students’ peer-review workshops in those same writing classes. Mahon, Wade. (2011). Multimodal composition & the rhetoric of teaching: A conversation with Cheryl Ball. Issues in Writing 18(2). 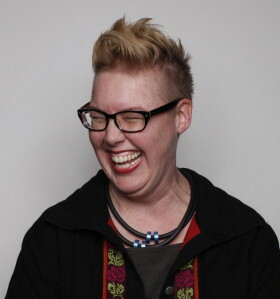 Cheryl Ball is an Associate Professor of New Media Studies at Illinois State University where she teaches courses on multimodal composition as well as digital media, composition theory, and digital publishing. She gives talks and workshops on these topics around the country and has published and collaborated on a number of articles, edited collections, book chapters, and webtexts as well. She has also co-authored with Kristin Arola a textbook, Visualizing Composition. In addition to her research and teaching, she is also the editor of the electronic journal Kairos: A Journal of Rhetoric, Technology, and Pedagogy. IW editor Wade Mahon spoke with Ball by phone on June 23, 2011. September 5, 2010 Books, Textbooks Comments Off on "visualizing composition"
Define. Illustrated definitions help you visualize principles of layout, design and composition: element, contrast, purpose, text, framing, audience, alignment, context, emphasis, color, proximity, organization, and sequence. Analyze. Guided readings of real-world texts—such as photographs, movie clips, comics, and animation—model how writers of different texts put theory into practice. Respond. Interactive assignments invite you to make your own rhetorical choices—determining font face or color, image hue, and the placement and organizational of visual and textual elements—and to write about the impact those choices have. Note: This is the second edition of ix, the CD-ROM Arola and I co-authored in 2004. In this version, 9 of 13 tutorials (broken down by terms associated with rhetorical design choices) have been completely revised, with new and more multimodal examples and analyses.